Oh my: summer flew by and September is here! We’ve been working extra hard to get all of the back to school essentials out on the floor. 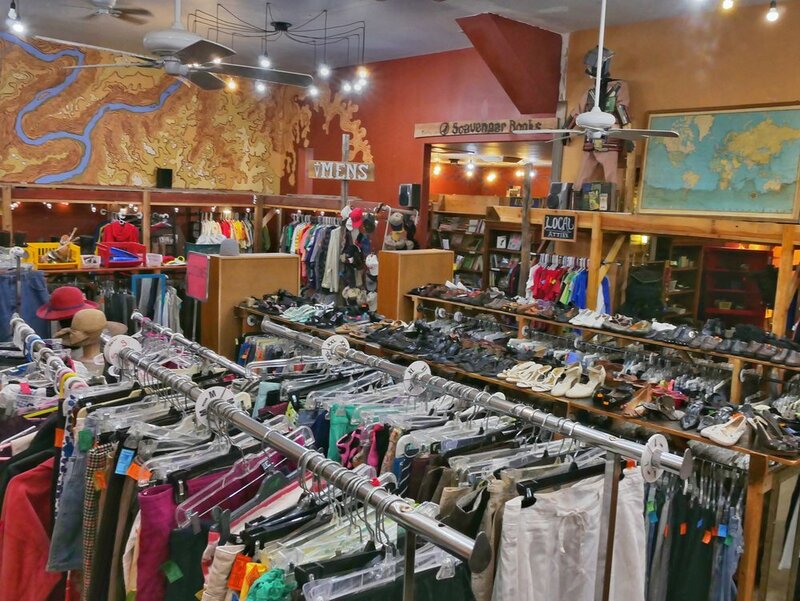 Now we’re thinking ahead to sweater season: stop on by 7 days a week to see what treasures you can find! In August, we were thrilled to give $10,000 to our Nonprofit Partners. Representatives from our 11 partner organizations joined us for a celebratory luncheon and shared stories and upcoming events. Huge thanks to the community for making all of this possible: what a heartwarming event! She came, she salvaged, she created! Our first ever Artist in Residence Lily Erb made this amazing bike rack for the front of the building! It's made from old metal clothing racks and other materials left over from our big move. We're excited to keep building this program: look out for an open call for artists in the near future! Get ready to get creative! Sign up for our September workshop before it's too late!!! Take the opportunity to create new from the old. We will be making watercolor designed coasters/tiles using creative techniques - all ages welcome, and all levels of artistry (you don't have to be a painter to create a beautiful piece)! Enjoy a night of art, laughs, and snacks, and leave with your own set of one of a kind designs!! This event is free, but we suggest a $5 donation, if you are feeling so inclined :) Can't wait to see what Moab will make! RSVP here, or email volunteer@wabisabimoab.org before spots fill up!! Have you heard? Thanksgiving is ON! The meal will be held at the Grand Center from 2 PM to 5 PM on November 23rd. We’ll be sharing more information about how to donate in advance this year.